By far and large, some of our best horseback rides in Banff are the ones that cross the cool, glacial and spring-fed waters that flow through the Bow Valley. Both our 1 hour Spray River, Banff Horseback Ride and our 3 hour Sulphur Mountain, Banff Horseback Ride give guests the unique experience of crossing the Spray River, while also viewing the jaw-dropping force of the Bow River as it cascades over Bow Falls. On a hot summer day, expect to stop in the river a little bit longer as your horse splashes water onto its belly, gets a drink, and allows you, the rider, the opportunity to enjoy this view for just a bit longer with the company of your horse. While river crossings may not have been anything unique to the pioneers that settled the Bow Valley, for us, it’s certainly a treat. Take a photo and take it in – this Rocky Mountain experience is one to treasure. So, what makes these two river crossing rides different? Well, the first obvious difference is time. While we definitely recommend the 3 hour horseback ride to capture a birds-eye view of Banff as you ride along the base of Mount Rundle, we understand sometimes schedules don’t allow for longer rides. Perhaps a 1 hour ride is just what you need to fulfill your Rocky Mountain horseback experience, and that’s okay! 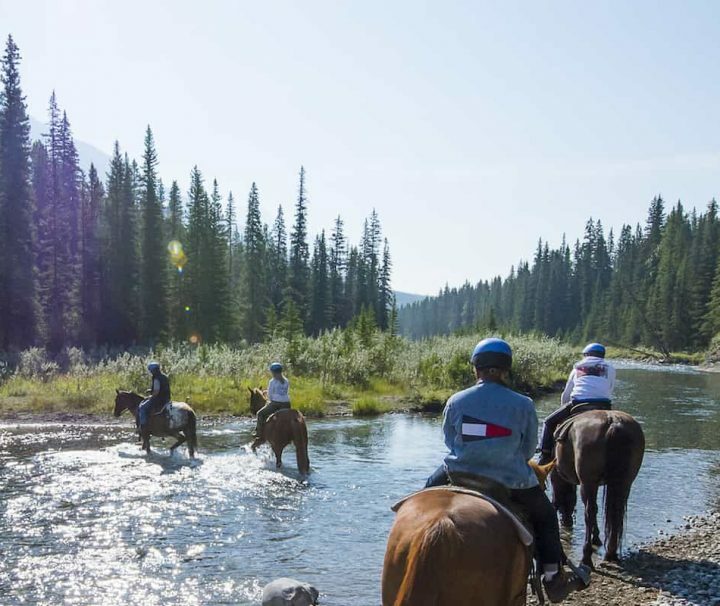 Our one hour Spray River Banff horseback riding trail ride is equally as immersive and takes you along the Fairmont Banff Springs’ golf course while giving guests an unforgettable perspective of the ‘Castle in the Rockies’. Of course, topped with the added excitement of crossing the Spray River, the one-hour ride is just a small portion of our longer half-day Sulphur Mountain Ride that also runs up 2/3rds of the way up the Sulphur Mountain with return views of Rundle Mountain. After your ride, check out the very hotel you viewed from an entirely different perspective. The Fairmont Banff Springs is a historical icon to the start of tourism in Banff, and definitely worth a visit. 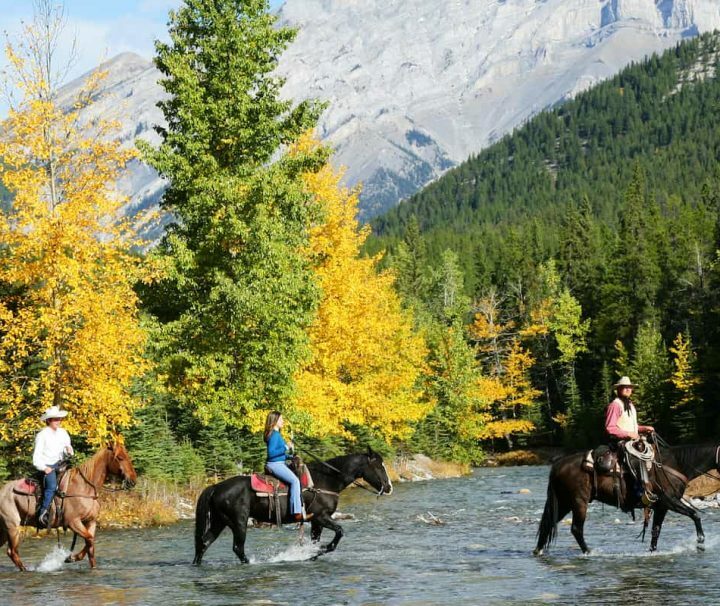 River crossing trail rides in Banff are found with Banff Trail Riders and both our one-hour and three-hour half-day tours give an unforgettable Rocky Mountain experience in Banff National Park. Book now, saddle up and come along for the best horseback riding with Banff Trail Riders! Cross a tranquil river on horseback and then admire an enchanting Rocky Mountain waterfall. The one-hour Spray River Ride gives you a great introduction to the untouched wilderness that can be found just outside the Banff town-site. Breathe in the pine-spiced mountain air as you approach the roaring Bow Falls. Sign up to our newsletter for updates on our horses, deals and special events.